Regional Migratory Osteoporosis is an uncommon disease. The lesion involved in the sacroiliac joint can cause low back pain. Department of Orthopedic Surgery, Koto Kosei Hospital, 98-1 Kawasaki, Kaiho,Hachirogata-machi Minamiakita-gun 018-1605, Hachirogata, Japan. Introduction: Regional migratory osteoporosis (RMO) is a rare, self-limiting disorder characterized by migratory arthralgia that mainly occurs in the weight-bearing joints of the lower extremities. RMO is most commonly observed in middle-aged men, and its etiology is unknown. 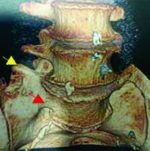 We report the case of a middle-aged man who experienced repeated low back pain that was caused by RMO of the sacroiliac joint (SIJ). Case Report: In this case, the patient initially complained of left low back pain; however, there were no specific findings in plain radiography of the lumbar spine and pelvis. In addition, blood chemistry test findings were normal. Magnetic resonance imaging (MRI) revealed a diffuse bone marrow edema in the left SIJ. Conservative treatment was effective, and the pain was relieved within 3 months. However, 2 months later, a similar pain developed on the right side. MRI showed bone marrow edema in the right SIJ and the left-sided lesion had disappeared. The symptom was relieved by conservative treatment. After 5 months, the pain disappeared and the MRI findings became normal. During the next 2 years of follow-up, there is no recurrence of the illness. Conclusions: To the best of our knowledge, this is the first report of RMO with a lesion that moved to the SIJ of both sides. We believe that knowledge of this disorder can prevent invasive procedures, particularly, in treating a patient with low back pain. Keywords: Regional migratory osteoporosis, transient osteoporosis, bone marrow edema syndrome, sacroiliac joint, low back pain. Regional migratory osteoporosis(RMO) is an uncommon disease characterized by a migrating pain, which is thought to be a type of bone marrow edema syndrome(BMES) [1, 2].While the pathology is largely unknown, it has a favorable prognosis and conservative treatment is effective [3,4]. It is commonly observed in middle-aged men with most cases arising in weight-bearing joints of the legs [1, 2, 3, 4, 5, 6, 7, 8, 9]. To the best of our knowledge, this is the first case report of this disease arising in the sacroiliac joint (SIJ). Herein, we report a rare case of RMO in the SIJ with repeated low back pain. A 49-year-old man with no medical history presented to our hospital with a 2-week history of the left low back pain. He reported a unilateral lower lumbar and buttock pain below the L5 spinous process that increased while sitting, particularly on a chair without a back rest. 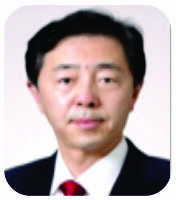 His physical examination revealed normal neurological findings, and tenderness on posterior iliac spine was reported. Moreover, provocation tests (Patrick’s test, Gaenslen’s test, and the SIJ shear test) indicated positive results on the left side. There were no specific findings in plain radiography of the lumbar spine and pelvis or magnetic resonance imaging (MRI) of the lumbar spine. In addition, blood chemistry test findings were normal. From the physical examination, SIJ pain was strongly suspected. However, the SIJ block under fluoroscopic guidance was ineffective. We prescribed nonsteroidal anti-inflammatory drugs (NSAIDs) and observed the patient through follow-up. We performed MRI of the pelvis 2 weeks later. 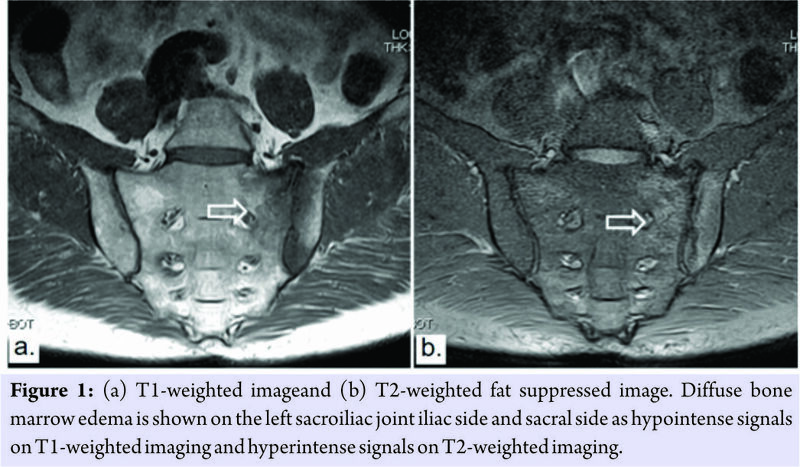 MRI of the left SIJ revealed low signal intensity on T-1 weighted images and high signal intensity on T-2 weighted images. It revealed a diffuse bone marrow edema in the left SIJ (Fig. 1). Computed tomography scan of the pelvis was then performed for differential diagnoses of the lesion, however, neither tumors lesions nor fractures were detected. The treatment course was local rest and continued NSAIDs administration, and the pain resolved within 3 months. However, 2 months later, he was referred to our hospital again with right low back pain. The physical findings and examination were similar to the initial consultation. MRI revealed a diffuse bone marrow edema at the right SIJ; the left SIJ bone marrow edema had disappeared (Fig. 2). The patient was administered the same treatment course of local rest and NSAIDs. After 5 months, his symptom disappeared, and the MRI revealed a disappearing bone marrow edema with normal findings (Fig. 3).During the 2 years of follow-up, there has been no recurrence of illness.A diagnosis of RMO was made from the course and characteristics of this case. BMES is a group of diseases with unknown pathology that cause local, temporary bone atrophy. It is commonly observed in women in the third trimester of pregnancy and middle-aged men . RMO is considered to be a type of BMES, and it is characterized by local, temporary bone atrophy impairing joints in a migratory manner [1, 2, 10]. The impaired joints are mainly weight-bearing joints in the legs, such as the hip, knees, and ankles. This disease is more common in men than in women [4, 6, 8, 9]. According to Karantanas et al., lesion site migration occurs every 3–4 months. Cahir and Toms reviewed world literature which has revealed 63 documented cases of regional osteoporosis or bone marrow edema with migratory symptoms. They suggested that most of these cases have not been labeled as RMO; therefore, the condition is possibly under-diagnosed . They also suggested that as RMO and transient osteoporosis of the hip cannot be differentiated in the absence of migration symptoms, these two diseases may belong to the same category. 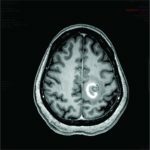 Avascular necrosis (AVN) might show similar radiological appearances especially in the early phase, but the typical risk factors for AVN including glucocorticoid use, excessive alcohol intake, renal disease, or chemotherapy have not been reported in patients with RMO . Although the pathology of BMES remains unclear, transient ischemia is believed to be the most probable cause [2, 11]. Jerome et al. hypothesized that microvasculature damage causes tissue ischemia, bone marrow edema, and cell death. Koo et al. suggested that ischemic phase is followed by reactive hyperemia and vasodilatation and consequent increased intraosseous marrow pressure. This intraosseous elevated pressure produces the symptoms of the patients . RMO has a favorable prognosis and conservative treatments, such as rest, off-loading, and NSAIDs administration, are considered effective [5, 12, 13, 14]. It is a self-limiting disease that normally resolves over 6–12 months . Alternative treatment with bisphosphonates reportedly reduces the pain and shortens the treatment period . Schapira et al. reported that pamidronate administration in cases for which NSAIDs administration was ineffective quickly resulted in a sustained reduction in symptoms . Meanwhile, another report has found that bisphosphonates do not offer any significant effects . Jerome et al. reported a case wherein rest and NSAIDs administration without any bisphosphonates resulted in patients following a favorable course . We did not administer bisphosphonates to our patient and found that rest and NSAIDs administration alone resulted in a favorable treatment course. Many reports have described off-loading to reduce pain caused by RMO in weight-bearing joints [2,12,13]. Taking into account the resulting limitations to our patient’s activities of daily living, we did not provide any specific off-loading instructions. Fortunately, no bone fractures occurred; however, we regret not prescribing off-loading as it could have reduced local load and decreased the patient’s pain. To the best of our knowledge, this is the first report of RMO where in the lesion moved to both the left and right SIJs. In many patients presenting with low back pain,physicians tend to initially consider lumbar disease. We believe that knowledge of this disorder can prevent invasive procedures, particularly in treating a patient with low back pain. The lesion we have presented in this case report may not be so rare. In clinical setting, many of this lesion might have been overlooked so far. To obtain the proper diagnosis, knowledge to identify this lesion is very important. RMO of the SIJ can be a cause of low back pain. 1. Cahir JG, Toms AP. Regional migratory osteoporosis. Eur J Radiol 2008;67:2-10. 2. Suresh SS. Migrating bone marrow edema syndrome: A cause of recurring knee pain. Acta Orthop Traumatol Turc 2010;44:340-3. 3. Banas MP, Kaplan FS, Fallon MD, Haddad JG. Regional migratory osteoporosis. A case report and review of the literature. Clin Orthop Relat Res 1990;250:303-9. 4. 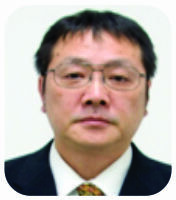 Horiuchi K, Shiraga N, Fujita N, Yamagishi M, Yabe H. Regional migratory osteoporosis: A case report. J Orthop Sci 2004;9:178-81. 5. 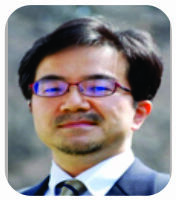 Yamasaki S, Masuhara K, Miki H, Fuji T. Three cases of regional migratory osteoporosis. Arch Orthop Trauma Surg 2003;123:439-41. 6. Trevisan C, Ortolani S, Monteleone M, Marinoni EC. Regional migratory osteoporosis: A pathogenetic hypothesis based on three cases and a review of the literature. Clin Rheumatol 2002;21:418-25. 7. Minutoli F, Gaeta M, Bottari A, Blandino A. MRI findings in regional migratory osteoporosis of the knee migrating from the femur to the tibia. Clin Imaging 2006;30:428-30. 8. Karantanas AH, Nikolakopoulos I, Korompilias AV, Apostolaki E, Skoulikaris N, Eracleous E, et al. Regional migratory osteoporosis in the knee: MRI findings in 22 patients and review of the literature. Eur J Radiol 2008;67:34-41. 9. Cadet M, Honig S. Utility of bone densitometry in diagnostic evaluation and monitoring in regional migratory osteoporosis. J Clin Rheumatol 2009;15:124-6. 10. Aigner N, Meizer R, Petje G, Meizer E, Abdelkafy A, Landsiedl F, et al. Natural course of intra-articular shifting bone marrow edema syndrome of the knee. BMC Musculoskelet Disord 2008;9:45. 11. Koo KH, Ahn IO, Song HR, Kim SY, Jones JP Jr. Increased perfusion of the femoral head in transient bone marrow edema syndrome. Clin Orthop Relat Res 2002;402:171-5. 12. Jerome TJ, Varghese M, Sankaran B. Transient osteoporosis of the knee. Case report. J Knee Surg 2008;21:334-6. 13. Straten VH, Franssen MJ, den Broeder AA, Obradov M, van den Hoogen FH. Regional migratory osteoporosis in a patient with ankylosing spondylitis. Scand J Rheumatol 2009;38:63-5. 14. Uzun M, Ayhan E, Beksac B, Karaman O. Regional migratory osteoporosis and transient osteoporosis of the hip: Are they all the same? Clin Rheumatol 2013;32:919-23. 15. Schapira D, Gutierrez G, Mor M, Nahir AM. 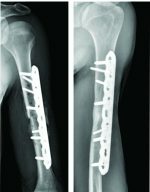 Successful pamidronate treatment of severe and refractory regional migratory osteoporosis. J Clin Rheumatol 2001;7:188-90. How to Cite This Article: Unoki K, Miyakoshi N, Shimada Y. Repeated Low Back Pain Caused by Regional Migratory Osteoporosis of the Sacroiliac Joint.. Journal of Orthopaedic Case Reports 2018. Mar- Apr; 8(2): 54-56.